It seems that DIY Bakelite jewelry isn't a new thing. 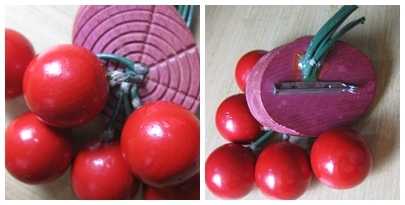 This vintage cherry brooch was made to look like a Bakelite brooch way back when. It has 6 wooden cherries on a carved wooden log base with the same lacquer dipped stems as Bakelite brooches. The pronged pin back is one of those sturdy oldies too! Ah that was a little confusing, but kinda a good way to keep track of things! As cliche as others say cherries are, I still love 'em. Maybe because they're my favourite fruit to eat? I just generally love edible looking jewellery haha! I love cherries and this brooch is so cute! It would be perfect on the black and white check blouse I'm wearing today. lol! How cute! I love cherries! Cherries are fabulous, summery, and timelessly cute! Maybe it's because I grew up on a street that had cherry trees on it (and thus ate scads of them in the summer), but I've always had a penchant for anything featuring this cheerful crimson fruit. Fabulous giveaway, dear gal, thank you for holding it! Gosh, that brooch is adorable!! And I loved your bakelite jewelry tutorial; I do have some vintage plastic knick-knacky pieces that I might try turning into jewelry! Wow - that is super cute! I found your tips super useful and printed them out actually to tuck them away in my vintage tips folder. Thanks for sharing the tips as well as offering this darling brooch up in a giveaway! Lovely giveaway. I hope I win! I'd like to keep in touch with you. What do you say about following each others blog via gfc and bloglovin? Wow, how cool! You are an inspiration! I'd love to win that adorable cherry brooch! Happy 4th of July! Love, love, love! Count me in! I really do want to win!!! It's so very cute! I am just getting started in my retro makeover, so I would LOVE some cute accessories!! I just found your blog and LOVE it, btw!! !